Stars forward Loui Eriksson arrived back in town looking well-rested and sporting a nice tan, after what he described as an “ideal summer” in Sweden. “The thing you do is take it easy and spend time with your family,” he said. Eriksson spent part of the summer working out in preparation for the new season. Now, he is back in Frisco and the workouts continue, both off the ice and on it. He’s among a small group of Stars who have started to show up in town, including a couple of new Dallas Stars in Ray Whitney and Derek Roy. It’s been a season of big change for the Stars, who also added Jaromir Jagr, Aaron Rome and Cody Eakin. When the Stars signed Jagr, Stars GM Joe Nieuwendyk said he envisioned a line with Jamie Benn at center and Eriksson and Jagr on the wings. Eriksson said he wouldn’t mind that line combination. And’s he’s excited about the additions of Whitney and Roy, who also will be a boost to the Stars set of top six forwards. 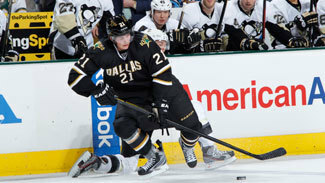 Eriksson also saw two longtime teammates – Steve Ott and Mike Ribeiro – depart the team via trade. Those departures have left Eriksson among the longest tenured Stars. Only Brenden Morrow, Trevor Daley and Stephane Robidas have been with the team longer than Eriksson, who turned 27 last month. Eriksson’s role as a leader on the team has been growing in recent years and that process will continue this season as the Stars are expected to bring in some youth to complement the veteran additions. Eriksson, who has topped 70 points in each of the last three seasons, said he is more of a lead-by-example type, but added that he’d like to be a little more vocal when offering guidance to the younger players. Eriksson has taken on a bigger role for Sweden at the international level as well, suiting up for the Swedes at the Olympics in 2010 and the World Championship in 2009, 2011 and again in 2012. In the 2012 tournament, which was held in May in Stockholm and Helsinki, Eriksson registered 13 points (5 goals, 8 assists) in eight games while playing on a line with Detroit’s Henrik Zetterberg and Johan Franzen. That line was among the most productive at the World Championship but the Swedes failed to medal, losing 4-3 to Czech Republic in the quarterfinals. Despite Sweden getting knocked out in the first game of the playoff round, Eriksson still tied for third in goal scoring at the tournament and ranked fourth in points. The World Championship provided a playoff-type atmosphere, something that Eriksson and the Stars are hoping to get back to this season after missing the NHL postseason these last four seasons.